A timpanist with Don Rico and his 16 Gypsy Girls, ca. 1932. If it's Thanksgiving, it must be time for another musical pun from Miles Hoffman. Last year, the music commentator chewed on musical leftovers. Before that it was symphonic turkeys. He's even demonstrated the art of plucking. This year, Hoffman beats a path into the studio with — what else? — drumsticks. Hoffman joins Renee Montagne for a holiday review of drums, triangles and other percussive instruments. 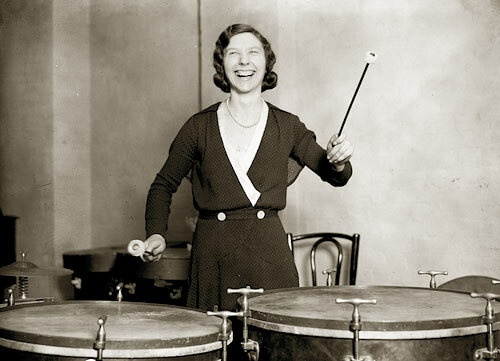 "The first drums that were used in Western orchestras were the timpani, or the kettle drums," Hoffman says. They first appeared in Europe in the 1400s, and they had been imported from (drum roll, please....) Turkey, where they had been used in cavalry bands. Percussion instruments are instruments that are sounded by being struck, shaken, or scraped. The percussion instruments most often played in symphony orchestras are the TIMPANI, SNARE DRUM, BASS DRUM, CYMBALS, TRIANGLE, TAM-TAM (GONG), GLOCKENSPIEL, XYLOPHONE, CELESTA, TAMBOURINE, and CHIMES (also called TUBULAR BELLS). Percussion instruments fall into two categories. The first category, which includes the timpani, glockenspiel, xylophone, celesta, and chimes, consists of instruments that produce sounds of definite pitch (they produce specific notes, in other words). In the second category, which includes the snare drum, bass drum, cymbals, triangle, tam-tam, and tambourine, are instruments that produce sounds of indefinite pitch. 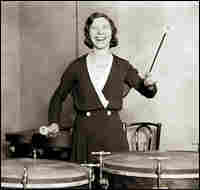 The TIMPANI, also called kettledrums, are the original percussion instruments of the orchestra. Their history can be traced back to ancient times in the Middle East, but they first appeared in Europe in the 1400s, imported from Turkey for use in cavalry bands. They were first played in orchestras in the 1600s, and they've been regularly employed in the orchestra since about 1700. Up until the early nineteenth century, timpani were generally used in pairs, and they were invariably teamed with trumpets to provide festive or martial effects. Each drum usually played just one note: if a piece were in the key of D major, for example, one drum would be tuned to the note D, the tonic of the key, and the other would be tuned to A, the dominant. With Beethoven, however, the timpani came into their own. He liberated them from the trumpets, expanded the range of notes they played, and even wrote distinctive solo passages for them. In the Beethoven Violin Concerto, for example, a timpani solo at the very opening of the piece announces one of the principal musical figures, or motifs, of the first movement. Romantic composers such as Hector Berlioz (1803-1869) and Richard Wagner (1813-1883) expanded the role of the timpani still further and increased the number of timpani in the orchestra as well. The Berlioz Requiem, which calls for sixteen timpani and ten timpanists, may be an extreme example, but nineteenth- and twentieth-century orchestral compositions regularly require three, four, or even five timpani. Usually the timpani are played by one person. The "kettle" of a kettledrum is called the "bowl" and is made of copper or brass. The "head" of the drum, the surface that the player strikes, is a piece of Mylar plastic stretched over the rim of the bowl. (Timpani heads were originally made of calfskin. Many players still prefer the sound of calfskin -- they feel that calfskin gives a warmer, deeper sound than plastic -- but for a variety of practical reasons, including the cost of calfskin and its sensitivity to changes in temperature and humidity, calfskin heads are now rarely used.) Tuning the drum to specific pitches is a matter of adjusting the tension of the head: to raise the pitch, the tension must be increased (the head tightened, in other words), and to lower the pitch, the tension must be lessened. This is accomplished with a pedal mechanism on most modern timpani, although hand screws around the rim are still used for fine adjustments. Timpanists can vary the sound of a drum by using drumsticks with harder or softer heads, and by striking the drum at different distances from the rim. While the heads of the softest sticks are made of sponge and those of the hardest are solid wood, the heads of "normal" timpani sticks are made of hard felt covered with soft felt. When a percussionist says, "I'm playing bells in this piece," he means he's playing the GLOCKENSPIEL is the German word for bell, and Glockenspiel, translated literally, means "bell-play." The modern orchestral glockenspiel, in use since the mid-1800s, consists of thirty tuned steel bars mounted in a portable case that's set flat on a four-legged stand. The bars are rectangular, and they're laid out in two rows, the arrangement corresponding to the arrangement of the black and white keys of a piano keyboard. The size of each bar determines its pitch -- the longer the bar, the lower the note. The heads of the mallets that the player uses to strike the bars are small, round, and hard, and may be made of plastic, rubber, wood, or metal. As with timpani sticks, different materials produce different sounds. In general, the sound of the glockenspiel is bright and penetrating. It can be extremely penetrating for orchestra members who happen to be seated right in front of it, especially if the glockenspiel player is using metal mallets. The XYLOPHONE is built very much like the glockenspiel, but xylophone bars are made of wood, not steel. Orchestral xylophones also have an array of metal tubes set beneath the bars to act as resonators. Camille Saint-Saëns used the xylophone in his Danse Macabre (1874) to depict the sound of rattling skeletons, and twelve years later he poked fun at himself by including a xylophone solo in the "Fossils" section of his Carnival of the Animals. Definitive statements about the origins of instruments are rare, since most instruments evolve from earlier forms, with details of the evolutionary stages often lost to history. No uncertainty surrounds the origins of the CELESTA, however. It was invented in Paris in 1886 by a French instrument manufacturer named Auguste Mustel. The celesta (or céleste in French, meaning "heavenly one") looks like a very small upright piano, and it has a keyboard like a piano's. It's more closely related to the glockenspiel than to the piano, however, since its keys are connected to hammers that strike steel bars. (Piano hammers strike strings. On the other hand, the celesta's sound is much softer and more ethereal than that of the glockenspiel. Tchaikovsky, who had heard the new instrument in Paris and found its sound captivating, was the first composer to write for the celesta: the "Dance of the Sugar Plum Fairy" from his ballet The Nutcracker (1892) features a prominent celesta part. CHIMES, also called TUBULAR BELLS, are long, hollow steel tubes usually between an inch and two inches in diameter. A standard set consists of eighteen chimes ranging in length from about three feet to just over five feet. The length of the tube determines the pitch -- the longer the tube, the lower the pitch. The chimes hang from a frame, and the player strikes them at the top with heavy, rawhide-covered wooden mallets. (Each chime is fitted with a steel cap that protects the rim of the tube.) Chimes are usually used in orchestral compositions to imitate the sound of church bells. It was a fad that brought the BASS DRUM, CYMBALS, and TRIANGLE to Europe from Turkey. The fad was for a kind of Turkish military music known as Janissary (or Janizary) music. The Janissaries, personal guard of the Turkish Sultans from the fourteenth century until 1826, when the corps was abolished, were renowned for their bands, which relied on the bass drum, cymbals, triangle, and an instrument called the Turkish crescent for their distinctive sound. (The Turkish crescent is a handheld stick with lots of bells and jingles hanging from crescent-shaped crossbars.) During the eighteenth century, military bands all over Europe copied the style -- and imported the instruments -- of the Janissary bands, and by the end of the century European composers had begun to include bass drum, cymbals, and triangle in their orchestral compositions to provide exotic flavor. Mozart used the three instruments in his opera The Abduction from the Seraglio (1782) to establish a "Turkish" atmosphere, and Beethoven used them in the finale of his Ninth Symphony (1824) to evoke the sound of a military band on the march. The SNARE DRUM is another instrument with a military background, and military drummers still play it, the instrument strapped to their side as they march. Another name for the snare drum, in fact, is the "side drum." Snare drums have two heads, with the top head, called the "batter head," being the one the player strikes. The "snares" of a snare drum are strings of plastic or twisted wire that run across the center of the bottom head ("snare head") and vibrate furiously against it when the drum is struck. The snares can be disengaged if a softer or duller sound is required. Snare-drum stroke combinations have colorful names: there's the "flam," for example, and the "drag." The flam produces the sound "ba- dum," and the drag produces either "ba-da- bum " or "ba-da-ba- bum." The longer of the drags is also called a "ruff." A "roll" is an extremely rapid alternation of strokes, and although there's no way for the listener to tell (it happens much too fast to hear or see), a snare drum roll is a not a simple alternation of single strokes, but rather an alternation of double strokes -- left-left, right-right, left-left, and so on -- or even of triple or quadruple strokes. Snare drum sticks are made of hard wood, usually hickory; each stick is a single piece of wood, tapered at the playing end to an oval tip less than half an inch wide. The familiar TAMBOURINE seems to have ancient origins in both the Near East and Far East, but the orchestral gong, called the TAM-TAM, is of purely Asian ancestry. (The word gong is from Java. Tam-tam is Chinese.) A bronze disk anywhere from about two feet to four feet across, the tam-tam can produce soft, mysterious sounds, as well as shatteringly loud sounds. The heavy, soft-headed stick used to strike the tam-tam is called a "beater." 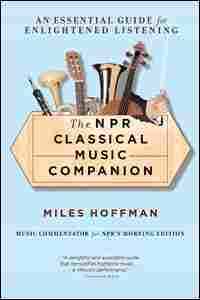 The principal timpanist of an orchestra, though a thoroughly trained percussionist, usually plays only timpani. The other members of the percussion section, however, must be prepared to play all the percussion instruments, including timpani if necessary, and including such foreign or exotic instruments as the bongos, maracas, and gourds. (The celesta is a separate case: it's considered a percussion instrument, but it's usually played by a pianist, not a percussionist.) In any one piece, a percussionist may be called upon to play several different instruments, which sometimes requires switching very quickly from one instrument to another. There are even times when a percussionist has to play two instruments at once, playing the bass drum with one hand, for example, and a cymbal suspended on a stand with the other. In a piece with multiple instruments and quick changes, percussionists have to make sure that their choreography is right: they have to know in advance which instrument they'll be playing when, they have to plan and practice their moves, and they have to arrange their instruments -- and their music stands -- in just the right positions. The percussion section is also responsible for producing orchestral special effects, which may mean playing the wood blocks, rattle, sleigh bells, cowbells, car horn, slide whistle, wind machine, chains, anvil, or any number of other interesting devices.